20 2 hand swings w/12kg 1 min on 1 min. rest x 4 sets = 8 min. 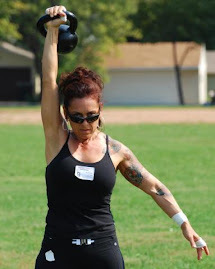 1 hand swing, clean, push press, trans. 2 min. on 1 min. rest x 2 sets = 5 min. Total warm up 13 min. All three sets took 4 min. to complete, I rotated them 8 times = 32 min. 128 double cleans, 128 double presses, 80 squats. 10/10/10/10 bottoms up cleans, 2 min. on 1 min. rest x 3 sets = 9 min. I only had 30 min. 40 2 hand swings w/12kg x 2 sets 1 min. on 1 min. rest = 4 min. x 8 rotations = 24 min. Even though I was using the 12kg for one of these sets, which is light for me, rotating it with the 16kg and only taking the 30 sec rest was killer! I don't know how I ever did my 1600 swing workout w/16kg and 30 sec. rest periods for a whole hour, man, I must be out if shape, lol! 1 min. rest x 4 sets = 6 min. Rotate these 2 sets 5 times = 12.5 min. Work up to 8 sets = 20 min. + 6 min. warm up = 26 min. Today marked the beginning of my 3rd month of KB training so I decided to try a "Deck of Cards" workout. all the face cards were 10 swings with the 16 kg. I'm embarrassed to tell you how long it took me to complete this but I did get through the whole deck. I'll be posting beginner variations of my own workouts at least once a week! A full deck of cards, ain't no joke! How many reps per set did you do, and did you take equal amount of rest? Even if you did 30 sec. on/off it would take at least 30 min, including the swings, (and were those 2 hand swings? ), if they were 1 min. on/off at least an hour! Absolutely nothing to be embarrassed about. You go girl! It took me about 50 minutes. For the swings with the 16 kg I started with 2 handed then went with 5 left and 5 right. I guess it was a total of 55 reps per exercise for the snatches, squats and double presses and 120 swings. I really enjoyed this workout! I need to add another big thank you for including the beginner variation. Makes a world of difference to those of use out here just starting out. I'm touched by the change in "tone" of your first/second comment from one of embarrassment to one of pride! You got it! I'll be including these variations much more often. I want people to realize that what I do now was a progression over the last 2 years and KB training is versatile enough for everyone at any level!